Sorry, Tinhorn Creek Vineyards does not ship wine to United States. Yellow in colour with an emerald hue. The nose is loaded with tropical fruit, banana, pineapple, papaya and lychee and the next whiff shows ginger, bubble gum and flowers. Not as sweet or viscous as the 2016 but still plenty of power here with similar mandarin and more bubblegum but with a slight grip in the finish, should age gracefully. Our Gewürztraminer was crushed and de-stemmed before pressing, with the pressing cycle for this varietal being unique to dark skinned whites. We typically have a longer press program that emphasizes slow extraction with extended skin contact as well as a higher pressure at the end. This allows the clear juice to be in contact with the skins longer, which is where much of the flavour in this variety is stored. There is a delicate balance of flavour extraction and phenolic extraction (tannins are also in the skins) that plays out, plus the wine can go pink if it’s in contact with the skins too long as the skins are a light red colour at harvest. Once settled, the clear juice was racked to stainless steel tanks and fermented at cold temperatures using native and selected yeast. This was a featured wine in October’s Wine Club package. Appearance: Bright, pale straw colour. Nose: Lychee, rose petal and ginger notes on the nose. Palate: Medium-bodied, just off-dry, exotic, lychee, cardamom and rose water flavours and Turkish Delight. Rich and full on the palate with a long clean finish. Quality: Outstanding quality. 91 points. A seamless wine with true varietal character. Drink now – 2019. Food Pairing: Thai curry dishes, Vietnamese-style jumbo shrimp on sugarcane skewers, smoked pancetta, beef satay with peanut sauce, Moo Shoo pork. 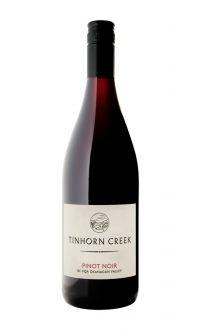 Tinhorn Creek has long been known for producing outstanding Gewürztraminer – a little bit spicy, a little bit sweet, and entirely delightful. The 2017 vintage is the best in recent years. Light bodied, but with a nice backbone of acidity, and heavenly aromatics of lychee, citrus and floral notes. Pair this graceful wine with lighter foods such as appetizers and hors d’oeuvres, spicy cuisine, or savour it on its own. Enjoy!